Thomas Dunne Books, 9780312334994, 320pp. The Cooke and Hood families have been at each other's throats since the Spanish Main days. The latest chapter in their piratic rivalry takes place in 2004, when an old treasure map turns up. None of this seems to matter to Morgan Cooke, a cowardly, landlubbing accountant entirely ignorant of his heritage until his estranged father, Isaac, in need of crewmen, kidnaps him and thrusts him into the fray. When Morgan wakes up on a boat in the middle of the Caribbean, he learns that piracy still flourishes, albeit with far more discretion than in the old days--pirates disguise their fast boats as shrimpers or tugs--but with no less bloodshed. Judging even a shot at riches vastly preferable to a return to his lonely, fluorescent-lit work station existence, Morgan pierces his ear, dons the eye patch and peg leg, and set sail for glorious adventure. Keith Thomson wrote and directed the short film, "Cupidity," which won the Napor Award. He has since written feature films for Tri-Star, Paramount and Disney. This is his first novel. He lives in Palo Alto, California. "Lubbers beware, thar be a thrilling new comic voice asea. The wind at his back, Keith Thomson has created a powerfully funny novel. Stocked to the quarterdeck with characters at once hilariously inconceivable and sweetly heartwarming, Pirates of Pensacola simultaneously thrills and endears itself with every explosively charged page. A delight to set sail with." "Set in modern times, Pirates of Pensacola follows our poor, nebbishy accountant hero into a life of waterlogged crime on the high seas. Best emerging comic novelist for a good long while, with touches of classic Rafael Sabatini and the most imaginative Hiaasen." 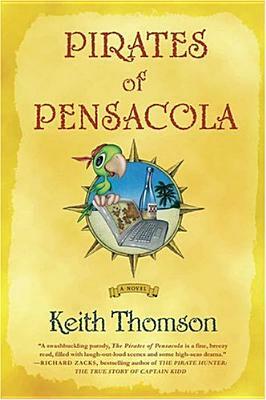 "A swashbuckling parody, Pirates of Pensacola is a fine breezy read, filled with laugh-out-loud scenes and some high seas drama. Who wouldn't crave the pirate lifestyle? You get to rob, cheat, carouse, brawl, drink, chase wenches and then rob some more, carouse some more...what a life! How about cutting these rogues some slack instead of a noose? To this book, I give my favorite mock-pirate toast: 'Bottoms up, shot glasses and lasses!'" "With rum, eye patches, peg legs, and a wisecracking parrot in need of a twelve-step program, Pirates of Pensacola blends all the conventions of the pirate genre and creates a novel of comic genius and originality. Keith Thomson is a shrewd and funny writer with a big future ahead of him."